Actors are being sought for a short film being produced by Phenomenal People, with an open audition to be held on June 1. 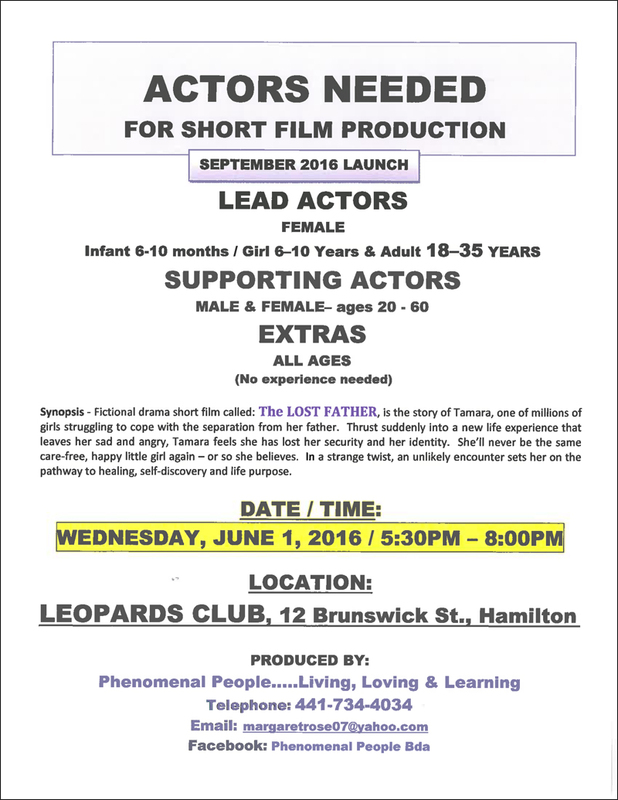 The audition will be held at Leopards Club at 12 Brunswick Street in Hamilton from 5.30pm to 8.00pm, with lead actors, supporting actors, and extras needed. Lead actors will include a female infant aged 6-10 months, a female aged 6-10 years old, and an adult aged 18-35 years old. Supporting actors needed include a male and female aged 20-60 years old, while extras of all ages and with no experience are welcome. The production’s synopsis says, “Fictional drama short film called: The Lost Father, is a story of Tamara, one of millions of girls struggling to cope with the separation from her father. For more information, call 734-4034 or email margaretrose07@yahoo.com.